Orville Wright at the control of the Baby Grand Racing Plane in Belmont Park, N.Y., in 1920 ("Kitty Hawk", Plate 104). The centennial anniversary of the first flight by Orville and Wilbur Wright on Dec. 17 allows Sam Houston Memorial Museum Director Patrick Nolan to reflect upon a chance encounter. It could almost be considered fate that Nolan received the opportunity to write a book about the Wright brothers about 30 years ago because of this encounter. Nolan had just started working as history professor and director of archives at Wright State University in Dayton, Ohio, for about a month in 1973 when he was approached about some Wright brother memorabilia. The owners of the memorabilia were the closest relatives to the Wright brothers, a niece and a nephew, who were left the materials after Orville died in 1948. "The university, Wright State (named after the brothers), was kind of a new university that Ohio had set up to serve the Dayton area," Nolan said. "So the niece and the nephew gave all these archives and papers to the university, which included several hundred photographs and letters and diaries. "They (Ivonette Miller and her brother, Horace Wright) just called up one day and said, 'We've got a bunch of Wright brothers papers that are kind of in the basement over here, and I wonder if somebody from the university might be interested in them,'" Nolan said. "There was just photographs and manuscripts just sitting there in the basement." Though Nolan said he had never particularly been interested in airplanes as a child and had no background in aeronautics, he couldn't resist taking a look at the materials. "We had a great collection that nobody had ever seen before, with all these pictures and all this stuff that had pretty much been kept in the basement of these folks house in Dayton, Ohio," he said. "This was the first time that a lot of these documents were ever really out there for people to look at." Nolan and Wright State photography professor Ron Geibert decided to put all the material together and create a book. "We figured that this is a real good opportunity to both find something that people would be interested in getting and also publicize and promote the archives of the university," Nolan said. "Kitty Hawk and Beyond: The Wright Brothers and the Early Years of Aviation" became the product of the Wrights' papers, a lot of research and interviews. The book was published in 1990 by Wright State University Press. As the Dec. 17 anniversary of the famous flight approaches, the book was reprinted and re-issued by Roberts Rinehart Publishers because Wright State University Press went out of print. "It's not just a reprint, we actually did change some of the text, we updated some of the references, there's a new introduction by the director of the Aerospace Museum, we made some corrections to some errors that had gotten into the first books," he said, "so it's more than just taking the book and just copying it literally, like a Xerox." Nolan said the book focuses on both the personal and scientific aspects of the Wright Brothers' lives. "That's one of the reasons we did it, because most of the images and most of the things that people had been talking about was the pictures of the airplanes themselves. But these guys had a very interesting family life, they had lots of friends, they had brothers and sisters and their father was an interesting man," he said. "There's just a lot there that wasn't really part of that public persona. We chose a lot of that-we have their report cards in grade school and their Christmas tree; things that were just kind of part of their lives." 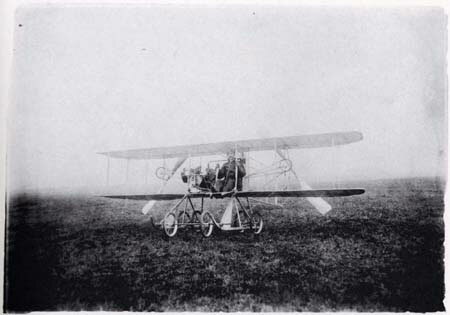 The amount of documentation of the first flight is one of the biggest things that separates the Wrights' feat from others' inventions. "One of the things that made the book so fun to do was that they were very conscious of what they were accomplishing, and they started out right from the beginning to document everything they did," Nolan said. "They took pictures of everything and they wrote it all down because they knew that if they succeeded people were going to assume it was a fraud. "So they wanted to have pictures, they wanted to have everything there to show what they had done, which is why we have the first flight picture and all that that shows it taking off because they actually had a guy with a camera stationed right there, ready to take the picture," he said. "You can't say that about most other inventions." "They realized that the real problem in flight wasn't having a motor that could power it, they had that, they had propellers, they've had propellers on ships for a hundred years. They realized the real problem was controlling this thing in the air," he said. "All the other experimenters were killed before they could learn what to do. So the thing that they really developed was the system of controlling an airplane in flight, and that's what they patented and that's what we still use today." The fact that modern aviation does still use the same control system invented almost 100 years ago is one of the most amazing parts of the invention, according to Nolan. "We've come a long way in 100 years," Nolan said. An example of how far we've come occurred at a symposium in which the niece who donated the materials, Ivonette Miller, had attended, Nolan said. "She (Miller) was a teenager when the Wrights flew in 1903. She was the first teenager in the world to fly in an airplane and the second woman to fly in an airplane," he said. "When she finally died, she was the only person left in the world who flew in an airplane piloted by one of the Wright brothers. "While I was in Dayton, we had a symposium, and we invited Neil Armstrong to come up and be the introducer for it, because he was in Cincinnati. We had, on the platform together, the last person alive to fly in the Wright Brothers airplane being introduced by the first man to walk on the moon," he said. "I just thought, 'That's one lifetime.' In less than 100 years, we've gone from something that looks like an egg crate to guys walking around on the moon. Now that is a hell of a story."